UNIVERSITY PROGRAMS - Buffalo-Dortmund Auslandsgesellschaft.de e.V. The exchange program with the State University of New York at Buffalo State and Fredonia State was established only recently and first took place in January 2017. The program was divided into a language course and an informational seminar on the topic of refugee initiatives. Lynn Engle and Kimberly Kline were contacts and accompanied their groups of students throughout the program. Additionally, weekend or day trips to cities like Amsterdam and Berlin took place. The students and both program leaders stayed in host families in Dortmund and the surrounding area. On the one hand students of the language program took German classes and improved their language skills in a native environment. On the other hand graduate students in the Higher Education and Student Affairs Administration program learned about the similarities and differences between Dortmund and Buffalo’s way of integrating refugees in their communities. Therefore they toured German universities in and around Dortmund and several resettlement agencies and communities. 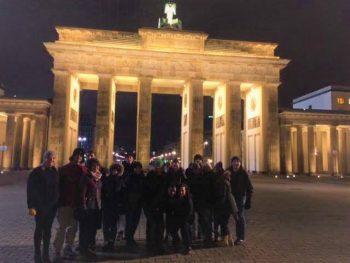 In addition, both groups got to know German culture and learned about German history on their visits to a former SS police headquarter in Dortmund or the Holocaust Memorial and Museum in Berlin. In 2018 the language exchange program will take place again and Lynn and students enrolled in German minor will come to Dortmund again. If you’re interested in German language and culture, participate in the program and help build a tradition out of it! 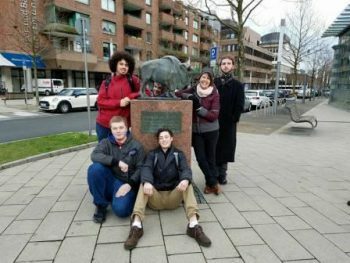 American students stay for three weeks in Dortmund in J-term. In 2018 the J-term exchange program takes place from January 9th through January 25th.